The following is a short list of our most frequently asked questions (FAQs). If you don’t see your question here, please feel free to contact us. How much are your residential design packages? As with solar installation costs, our price for residential design and engineering services depends on the size, complexity, and volume of work. “Complexity” can include additional battery designs, EV-charging, elevation views, wind turbines, diesel generator-set integration and transfer switch controls, and structural and electrical professional engineer (PE) stamps. For the most accurate estimate of your solar design costs, request a free design quote through our SepiPortal. How much are your commercial, utility, and microgrid design packages? Commercial and Industrial (C&I), utility, and microgrid designs are more complex than residential systems, especially when energy storage is added. For the most accurate estimate of your large-scale solar design costs, request a free quote through our SepiPortal. When SepiSolar gives you a solar or storage design estimate, we base our quote on a “Not-to-Exceed” (NTE) pricing structure. That means that we charge you for the hours we estimate to complete the original scope of work multiplied by hourly rate of our engineer or the actual hours spent, whichever is less. The NTE amount will only be exceeded if the original scope of work and project details change. SepiSolar’s delivers most residential designs in 3-5 business days, and commercial plans in 7-10 business days, depending on design complexity. For high-volume clients, SepiSolar assigns a dedicated engineer that can generate multiple designs in less than a day. A one-time expedite fee can also be applied to any project if turnaround is needed by a certain deadline. Register to the SepiPortal for a fast, free estimate for one project or for high volume monthly pricing. What size projects can you design? From residential to commercial to full utility scale with energy storage, SepiSolar is your one-stop shop for all solar and energy storage design and engineering. Whether your project is rooftop, carport, ground mount, medium-voltage, or high voltage single axis utility project, SepiSolar engineers design the most cost-effective PV systems that meet local permitting requirements. Do you design solar+energy storage? Yes. SepiSolar has a wide range of energy storage design services for residential, commercial, and utility-scale projects. In addition to our design work, we also offer technical and financial energy storage modeling. Can SepiSolar design solar and battery systems for any state? Yes. SepiSolar designs from California, but our NABCEP-certified engineers design solar-plus-storage systems for all 50 states and jurisdictions, as well as international projects and opportunities. Are your permit plans customized for each jurisdiction? We continuously update our proprietary database of permitting requirements, allowing us to design solar and storage permit plans for each jurisdiction and utility across the U.S.
How many designs has SepiSolar completed? Since 2009, SepiSolar has designed over 6.5 GW of solar projects. That includes over 4,000 residential, more than 2,000 C&I, and agriculture projects, over 50 commercial and utility storage projects, and above the 200 mark for residential solar+storage projects. Obviously, these numbers grow every day. The SepiPortal is our central hub for client communications and project folders. Request a quote, input site survey information, track progress, or chat with your project engineer. It’s all in one convenient place, and designed to efficiently gather info and keep a record of all projects and project data. How do I register for the SepiPortal? To register for the SepiPortal and receive a project estimate, fill out the info on this page. Watch this video to see the full registration process. Within a few clicks, you’ll be able to upload your project info and receive an estimate within 24 hours. How do I approve my design estimate? Watch this brief video to set up a new SepiSolar account and approve your first quote. The video will also show you how to track the progress of your design or make changes. How do I see or download my finished designs? After your SepiPortal account is created, you’ll get 24/7 access to your designs and any uploaded documents through a free Box.com account, which will then be integrated with your SepiPortal account. An email will be sent to set up your Box.com account after you approve your first quote. Watch this video to see how to set up Box and manage all documents. I’m already registered for the SepiPortal. How do I log in again? If you’re already registered and have your login and password, you can always navigate to the top of any page and push the red SepiPortal button above the “Get a Quote” button. Or you can just click here. What’s the meaning behind the “SepiSolar” name and logo? Every SepiSolar designer works in the U.S. from our Fremont, California offices. If you’re ever in the Fremont area, come by and meet the team! Do you have licensed electrical and structural PEs on staff? Yes. SepiSolar can also provide structural and electrical professional engineering stamps in all 50 states. Contact us for pricing. First, visit this page to learn how to register in our SepiPortal. After registering, you’ll be emailed a link to your private SepiPortal, where you can view all quotes, communicate with engineers, and check the status of all projects. The SepiPortal estimate form will guide you to upload all the needed site-survey information to give you an accurate quote. Fill in as much information as you can and then click submit. You’ll receive your estimate within one business day. If you’d like to move forward, fill out the payment information and then approve the quote. SepiSolar will then set up a brief consultative kick-off call with a senior engineer. Together, you’ll go over project details and discuss any needed information to complete the design. SepiSolar accepts Visa, MasterCard PayPal, ACH transfers, wire transfers, and checks. Payment information and instructions will be provided after you approve your estimate.  Most of our designers and engineers are certified NABCEP PV Installation Professionals, and those that aren’t are in the process of doing so. We also require designers to go on site and participate in at least one solar or storage installation per year. Doing so allows them to understand how their work affects our customers and generates new ideas for more efficient designs and easy-to-read permit plan sets.